Kerry Dixon, formerly of Chelsea and England, is not the first – or last – ex-professional footballer to go to prison. The game’s history is littered with stories of Saturday’s heroes falling into decline, disrepute and, often, an early grave. Few of us can imagine what is going through Kerry Dixon’s mind today as he begins a custodial sentence. Remember the look of sheer terror on George Best’s face when he was sent to prison back in the 1980s? When Dixon was signed from Reading in the summer of 1983, he was certainly the “big blond hope” for a Chelsea team that had only just avoided relegation to the old third division. He had enjoyed a couple of good seasons at Elm Park and the bigger clubs were looking at the youngster. Chelsea secured him, largely thanks to Ken Bates’ financial acumen, for a bargain £ 150,000 – a fee that went up by £ 25,000 if he received an England cap. His impact at Chelsea was immediate – at last, a goalscorer for the fans to latch on to. He scored on his debut, a 5-0 win against Derby, and in total, netted 34 times in the 1983-84 season as Chelsea romped to the second division title. Dixon formed part of an exciting trio that also included David Speedie and the wonderful Pat Nevin. Chelsea, after years in the doldrums, had found icons to replace the Osgood – Hudson – Cooke era at the Bridge. Dixon followed up his debut season with 24 first division goals and 36 in all competitions. His performances earned him an England recall – good news for Reading – and in the summer tour to Mexico, he scored four times. Although the 1985-86 season was hampered by injuries, Dixon scored 23 times and was on the plane to Mexico for the World Cup. With his boyish looks and blond hair, Dixon was the identikit “soccer star” and was a publicist’s dream. He got four minutes in the 1986 World Cup, replacing hat-trick hero Gary Lineker in the must-win 3-0 success against Poland. He only appeared briefly again for England in a friendly with Sweden in September 1986. The next two years at Chelsea were less successful for the club and for Dixon. There was talk of him moving to Arsenal at one stage, but he stayed with the club while the team of 1983-85 imploded. He rediscovered his prolific goal touch, though, and by the time he left the club in the summer of 1992, he had scored 193 goals for the Blues. Although he moved to Southampton, reuniting with his old sparring partner, Speedie, and then played for Luton and Millwall, he will always be remembered for his Chelsea career. He didn’t stop playing when the big money dried up, however. Deep down, it appeared that he just wanted to put his boots on. I saw him turn out for Letchworth when he was nudging 40. The pace had gone, the hair not quite so golden, the girth a little more generous, but you couldn’t mistake the touch or the running style. And in the North Herts/Mid-Beds area, Kerry’s name still had currency. Those that remembered his glory days were in awe of him, young players who wanted to rub shoulders with a Chelsea legend would clamour to get near him at the bar. It was a similar story when he became manager at Hitchin Town, although his spell in charge was far from successful. The main problem was his availability. Kerry was sought-after as a pundit, by Chelsea and by national TV or radio. Therefore his livelihood was on a Saturday afternoon. It was never going to work. But when he was there, he seemed incredibly humble and didn’t have the “big-time Charlie” attitude that some former professionals acquire. He was also generous-natured. It was a difficult decision for Hitchin to part with Dixon as he was a likeable sort, but a manager is needed at a game, regardless of the level of football he’s plying his trade at. It was a marriage that was never going to work – for both parties. I bumped into Kerry again at Chelsea in February 2012, the occasion of my son’s first visit to Stamford Bridge. He was rushing out of one of the hospitality lounges, doubtless heading for another session of hand-shakes and bonhomie. On his way out, people were slapping him on the back and calling out his name. Once you are a legend at Chelsea, you remain one. He shook my hand and he enquired about Hitchin’s fortunes. He then spoke to my son and I explained it was his first visit to the club. “Enjoy it, son. Enjoy it.” My lad was quite chuffed that Dixon had spoken to him, even though his knowledge of Chelsea was limited. 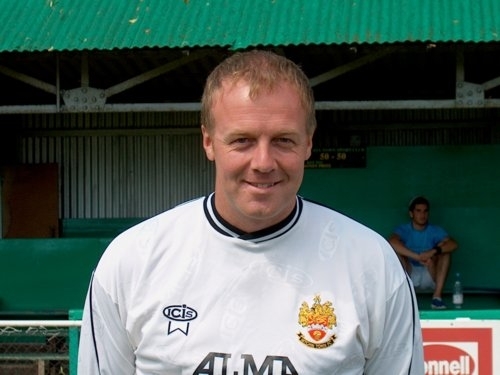 There were no hard feelings about his time at Hitchin – as a football man, he would have appreciated that one thing is bound to end and that’s a manager’s time in charge. It’s part of the game. Sadly, it’s a by-product of the game that former players become targets with some people. Dixon hasn’t had the best of luck or, so it would appear, judgement, since he retired. He’s had bad press and even worse incidents. The latest one was a tipping point and it’s truly sad what’s happened. Today, he may recall, with more than a hint of sorrow, that he was once one of English football’s most coveted assets. Not unlike his pal Kenny Sansom, whose plight was recently reported in the press. One thing is certain, there will be no shortage of people wishing him better times, and you can be assured that Chelsea fans will be quick to chant his name when the new season starts.